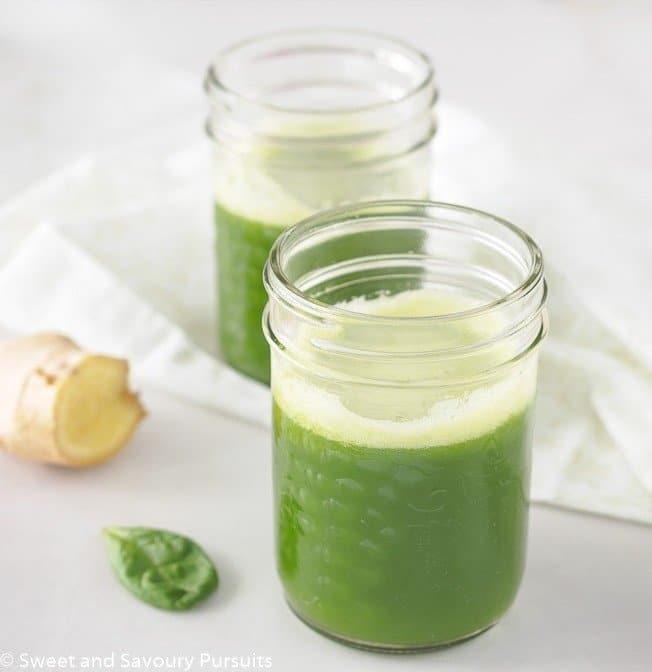 This vibrant Pineapple Spinach Juice with Ginger is delicious, refreshing and best of all full of nutrients and vitamins! I first tasted green juice when my cousin wanted me to try a kale and pineapple juice she had discovered. I was a bit hesitant at first, the colour wasn’t exactly appealing, but I tasted it anyways and found the drink very enjoyable. Since drinking that glass, I developed a bit of a craving for this green juice, so one day I decided to take my juicer out of the deep dark corner of my cupboard and try my hand at making my own tasty green juice. I made my juice with spinach instead of kale, added some fresh pineapple and an apple. The juice turned out delicious. Then a few days later, I made it again, doubling the amount of spinach and adding a bit of fresh ginger. 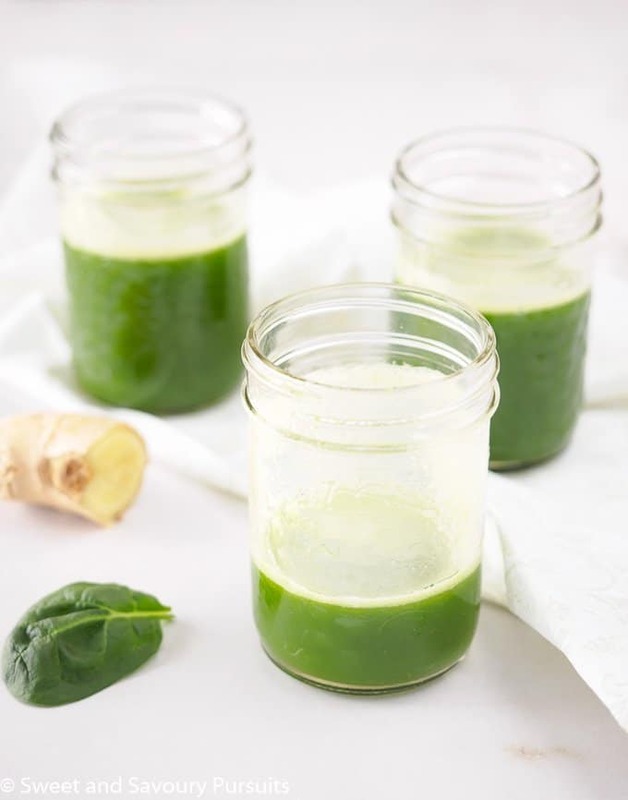 Just a small piece of ginger makes a real difference, it added a slight zing to the drink and really complimented the spinach and fruit in this juice. Though I’m not a nutritionist, I think that eating your veggies and fruit, with all the fiber in them, is the most beneficial way of consuming fruit and vegetables. However, I think that juicing is a fun way to try combinations of fresh fruit and veggies that you wouldn’t otherwise eat together. Plus, it’s a bonus way to get more nutrients and vitamins into your diet, especially if you can convince your picky kids to give it a try. I still can’t believe I got my pickiest child to try this spinach juice and admit that she likes it! I’m thinking of trying different combinations of vegetable and fruit juices and making popsicles out of them this summer! 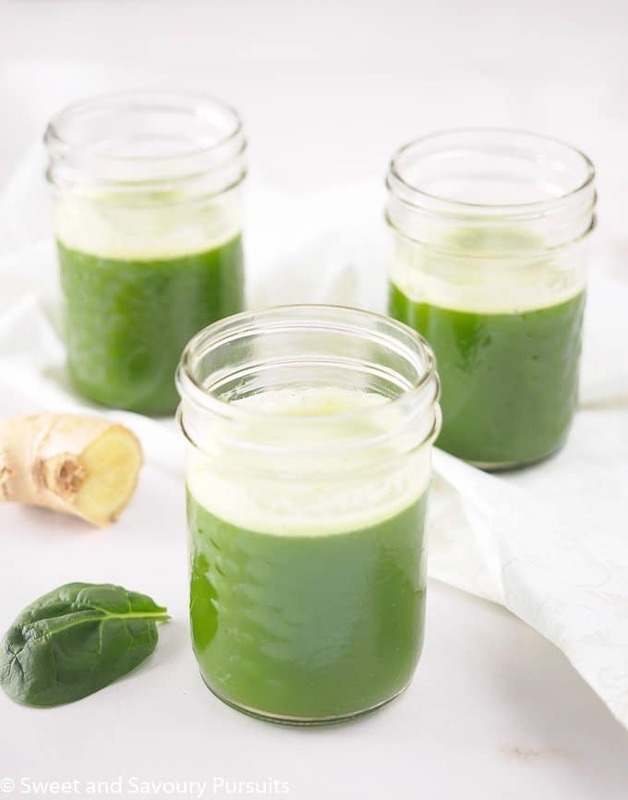 If you don’t own a juicer but would like to try out a green drink recipe, this Pineapple Spinach Smoothie is very similar to this juice. Enjoy! Press the spinach, apple, pineapple and ginger through a juice extractor. If you prefer a juice with less pulp, you can pass the juice through a fine mesh sieve before serving. I’m with you, I have a thing about green drinks so my smoothies mainly consist of fruits. 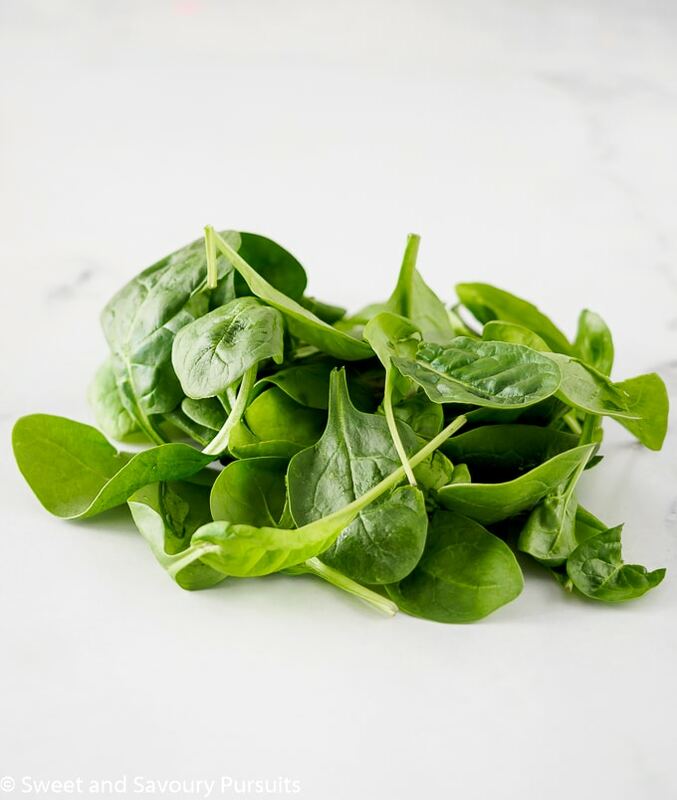 But I do love spinach and combining it with spinach is brilliant so I’m in. Lovely photos! Thanks Robyn! I know, not the most appealing drink colour, but it tastes so yummy. This looks so healthy. I don’t have a juicer but wouldn’t mind a thicker drink from the blender. A perfect tonic for this time of year! yum!! I have been on a bit of a juicing kick lately too!! Thanks Eleanore! I would love to know what your favourites are. Wow!!! I love that you’re exploring juices! This looks like LIFE. Thanks Amanda! We should get together and explore different combinations, I’m sure you would come up with something delicious! I will try this. I don’t have a juicer but will see if my local juice place can make it for me. I bet it is delicious. That’s great Suzanne, do let me know how you like it. I’m thinking of making it in the blender and see what it would be like as a smoothie, probably add some yogourt as well. Have a great weekend! Thats a great idea. I bet it would make a great smoothie, I’ll try that. I have everything but the pineapple will get it tomorrow. Yes will let you know. The yogurt sounds great. Ok! Looking forward to hearing what you thought.